Welcome back. Having grown up a staunch believer in Superman’s truth, justice and the American way, I was quite troubled by the 2015-2016 presidential primaries and election. In my November 2015 blog post on the call for candidates to debate key science issues, I wrote: I think it could be useful if measures were taken to present the scientific consensus and avoid or correct misinformation (Voters Endorse Science). I was wrong. Even if done immediately, correcting misinformation, i.e., fact-checking, would have mattered little as was shown in a recent study by researchers from the Massachusetts Institute of Technology (MIT), University of Western Australia and the UK’s University of Bristol. The researchers conducted two experiments to assess how partisanship and prior beliefs influence the way people process political misinformation. Both experiments used statements Donald Trump made during the primaries. The first experiment was conducted in November 2015 when there were 14 Republican candidates. Eight of Trump’s statements--4 true, 4 false--were presented to 1776 test participants (about half male, half female, average age 36; 57% self-identified as Democrats, 30% as Republicans). The participants rated their belief in the statements, which were either attributed to Trump or presented without attribution. Republican supporters of Trump believed the statements more if the statements were attributed to Trump. The opposite occurred for Republicans who didn’t support Trump and even more so for Democrats. The statements were then corrected or affirmed for the participants with a brief explanation either immediately or after a one-week delay. The participants re-rated their belief in the statements. 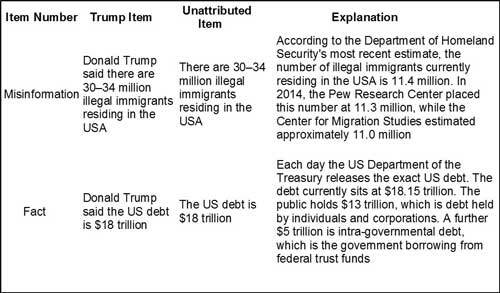 Examples of Trump-attributed and unattributed items and explanations from study. The corrections, affirmations and explanations caused a large bipartisan shift in belief, as I would have hoped. But after a one-week delay, participants partially reverted to their original assumptions. They believed false statements once again and seemingly forgot true statements were true. It was clear that once false information is in the public sphere, it is difficult to correct; and that reservations regarding factual information are likewise difficult to overcome. Republican Trump supporters showed the highest level of post-explanation belief in misinformation for both Trump-attributed and unattributed statements. The second experiment, conducted in July 2016, tested how the source of the explanation affects belief in the statements. 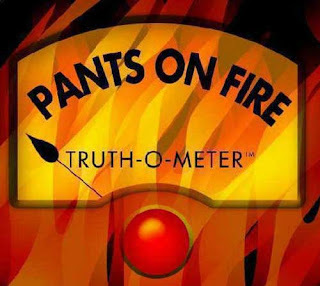 Six of Trump’s statements--3 true, 3 false--presented to 960 participants were all attributed to Trump, but the explanations were attributed to either Republicans, Democrats or a non-partisan fact-checking website. Suffice it to note that the results showed the explanation's source had relatively little effect. Partisanship and Trump support were far better predictors of any change in belief. The study also found that, even if Trump supporters reduced their belief in misinformation following a correction, they did not change their voting preference. It suggests that politicians can spread misinformation without the negative consequence of losing supporters. Partisanship reigns, yet I (and Superman) can only hope that this election was anomalous given the many negatives fairly or unfairly associated with other candidates, especially Hillary Clinton. It will be interesting to see if President Trump’s continued mix of fact and fiction will have any effect on his supporters. Since gaining a better grasp of fact over fiction would require that his supporters accept mainstream media accounts, it might take a while.